Detroit, MI -- Oversight of the Detroit Water and Sewerage Department (DWSD) will be transferred in the next few months to a regional authority, the Great Lakes Regional Water Authority (GLRWA). It will consist of representatives from Wayne, Oakland and Macomb Counties, the State of Michigan, and the City of Detroit. The Detroit People’s Water Board Coalition disagrees with the decision to transfer oversight of the DWSD to the GLRWA for several reasons, including: (1) the detrimental effect it will have on Detroit residents who continue to bear the burden of infrastructure costs without full system control; (2) the failure by local authorities to implement the 2005 Water Affordability Plan which provides for low income affordable payment plans and conservation efforts; (3) the circumvention of democratic proceedings in the development of the GLRWA; (4) the failure of all parties to protect water as a human right and as a public trust. (See the Statement on the proposed Great Lakes Water Authority) (5) the continued threat of privatization of Great Lakes water, which should be held in common; and (6) the implicit entitlement by the GLRWA to assume DWSD ownership rights after the Detroit-paid water system was expanded at the request of suburban communities to serve their needs. Notwithstanding our opposition to the formation of a regional water authority and the 40-year lease of the Detroit Water and Sewerage Department, GLRWA appointments have already been made from Oakland and Macomb counties. To the extent that the DWSD and City of Detroit decide to go forward without the vote and consent of the people of Detroit, it is imperative that community-based representation on and appointments to the GLRWA take place for Detroit and Wayne County. The Mayor of Detroit has not yet appointed two representatives from Detroit, nor have the Governor and the Wayne County Executive. 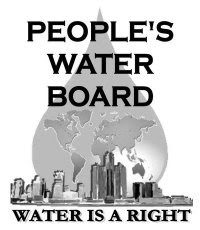 Given the water shutoff and affordability crises, the Detroit People’s Water Board Coalition proposes that citizen input and protection be included in the process. In order to accomplish this, we believe that: (1) Detroit City Council needs to create an ordinance that establishes a GLRWA Detroit Citizens Advisory Board whose membership is selected from community-based water experts. The People’s Water Board has candidates to submit. (2) One of the two Detroit appointees by the Mayor to the GLRWA should be from the GLRWA Detroit Citizens Advisory Board. The purpose of the Advisory Board is to protect the rights of Detroit citizens related to water affordability, and to review complaints/appeals from Detroit customers of the GLRWA. Since 2013 over 50,000 residential households have had their water shut off. At this time, as many as 36,324 people in the city of Detroit continue to live without running water in their homes (per research by Food & Water Watch). The Mayor’s Ten Point Plan does not adequately provide for the human right to water for all Detroit residents, especially the most vulnerable, including low-income households with babies and children, seniors and persons with disabilities. Human life is threatened and illness results when there is no water in a home. We believe this cruel disregard for the human rights and very survival of thousands of Detroiters is a direct result of the lack of democracy in the governance of the city and its water system. We demand that water service be restored to all Detroiters immediately and that democracy policies be added to the GLRWA by following the recommendations we outlined above.